VietNamNet Bridge –Vietnam’s top striker, Le Cong Vinh, and Hanoi T&T FC planed to sign their second 3-year contract today, September 23, but the striker changed his mind at the last minute. Hanoi ACB's Chair Nguyen Duc Kien and Cong Vinh. Cong Vinh has stated that he would not stay with Hanoi T&T, but move to Hanoi ACB at the invitation of this club’s Chairman, Nguyen Duc Kien. He said there are three reasons for his decision: First, he saw the aspiration for the V-League championship of Mr. Kien and he also wanted to win the second V-League championship with another team; Second, joining Hanoi ACB, he will play football better with the assistance of striker Timothy and midfielder Thanh Luong; Third, Hanoi ACB’s coach is Nguyen Thanh Vinh, his former coach at Song Lam Nghe An club. Both Hanoi T&T and Hanoi ACB FCs confirmed the information, but details of the contract between Vinh and Hanoi ACB were not disclosed. Hanoi T&T’s sponsor Do Quang Hien said perhaps Cong Vinh left his FC for money. Hanoi T&T’s executive manager, Nguyen Quoc Hoi said: “This is infantile behavior” and he said his FC is willing to let Vinh leave. 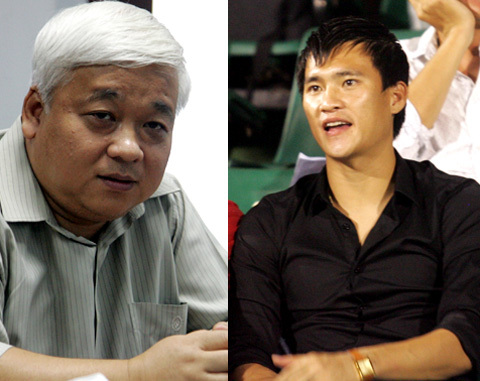 This is an unexpected move but there were some signs about Hanoi ACB’s plan to buy Cong Vinh when the club’s Chair, Nguyen Duc Kien, told the press that Cong Vinh deserves with VND15 billion. Fans are waiting to see how much does this striker cost. Whether his transfer price breaks the VND12 billion record of Phuoc Tu.